We Specialize in Delma Watches! Did your favorite Delma watch stop running or start to slow down? We know the feeling, but don’t worry, WatchGnome is here to help replace your watch batter. WatchGnome is America’s #1 mail-in watch battery replacement service. So you can stop wasting your time driving your watch around town to a fancy jeweler or that mall shop that wants to charge you $75. WatchGnome specializes in fast, easy and affordable Delma watch battery replacement. WatchGnome handles the whole process for you and you never have to leave your house. Order: When you place your battery replacement order, WatchGnome sends a padded box for your Delma and prepaid return shipping label straight to you. Pack it up: Just pack your Delma watch up securely. Place the USPS first class label on the box and drop in any mailbox. Replace battery: We get your Delma watch back to our workshop and change out your old watch battery for a fresh new one. Then we polish it up & set the time. You’ll get your Delma back in just a few days without ever having to leave your house! 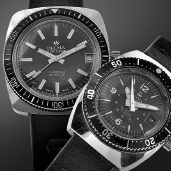 In 1924 the brothers Adolf and Albert Gilomen founded the beginnings of Delma Watches. The company was originally named the A. & A. Gilomen S. A. Company. They launched in Lengnau near Grenchen, Switzerland. The company as we know it today, got it’s official name Delma Watch Ltd. in 1966. WatchGnome is proud to offer Delma watch battery replacement. We love their products and are always excited to see one arrive in our mail order watch battery replacement boxes so we can make getting your watch battery running again easy!